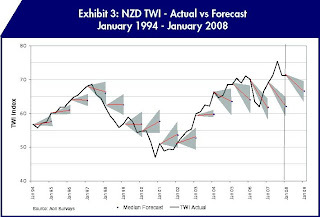 Just look at the recent evidence gathered by Whangarei commentator Rodney Dickens [What are the economic forecasters up to now? a complete dead loss, perhaps, but if you were relying on the "top ten"
to help you out in June '02 and June '03 you'd have been in trouble. making public predictions that are lapped up by media and business. Not much success there either, huh? Looks like that hypothesis can be abandoned too. combined" -- but he's at least aware that the public, that is, you, need to be aware not to take forecasters' predictions as gospel. or other, then everyone would act at the same time to make it so. [bureaucratic management] to take over the conduct of business." even suspect in what the fundamental problem of action consists. NB: I can recommend the regular ravings of Rodney Dickens to you, from whom most of the charts above are sourced. Click here to go straight to his latest Raving. Or click here to enter the 'Literacy Centre,' where you can access all Rodney's past Ravings. Submitted by Lindsay Perigo on Mon, 2008-07-07 23:33. I humbly point to my article Economists, A Waste of Space from a few months back. Potent symbols of the Age of Crap. Submitted by Elijah (not verified) on Mon, 2008-07-07 23:15. Quite right, too, Peter...and the investment forecast chaps are even worse! 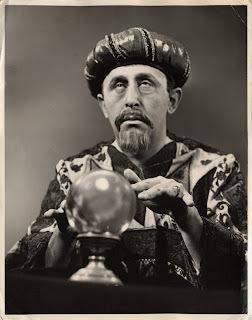 Anyone with half a brain could see a recession was on the way for New Zealand a year ago, and wise people (ahem) sold everything and made plans to rise it out, yet these economic chaps mindlessly were predicting it was not so.